OPAL is an African Lesbian Gay Bisexual Transgender and Intersex rights and human rights activist charity. 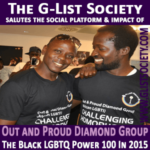 Our mission is to defend human dignity, freedom, justice and equality for LGBTI people in Africa. Abbey Kiwanuka, an African LGBT advocate, has been shortlisted for the Positive LGBT Role Mode Award category at the UK National Diversity Awards 2018.